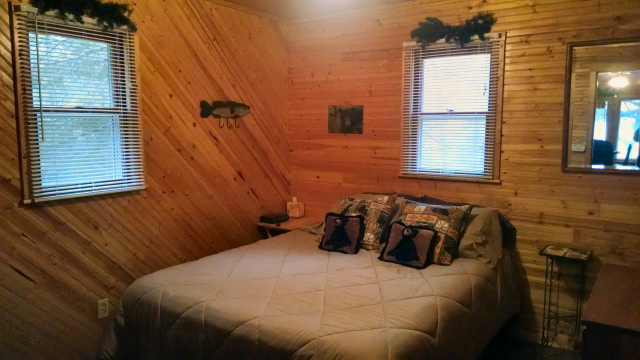 Condo Cabin on Lost Land Lake For Sale! 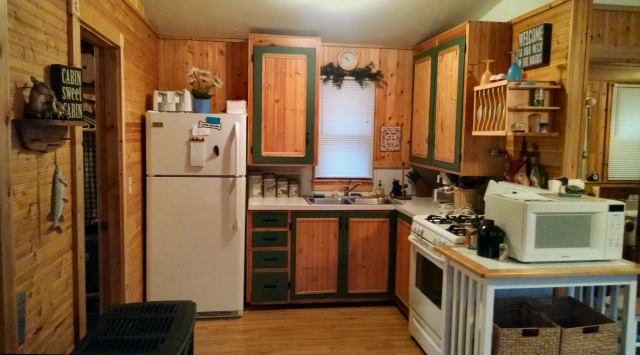 Come and see this darling condo cabin on the southwest shore of scenic Lost Land Lake! 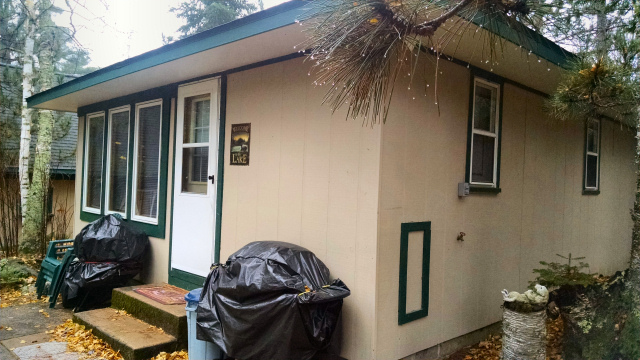 This 2 bedroom, 1 bath cabin is one of seven cabins in the Morgan’s Cove Condominium complex- all cabins share 6.51 acres of beautifully wooded land, and 385 feet of pristine sandy frontage on this picturesque lake! Lost Land Lake is located approximately 15 miles east of Hayward, and the lake covers over 1250 acres. Although it is a fairly large clear water lake, it is not very deep – 21 feet at its deepest points, with a mean depth of 12 feet. My sellers have enjoyed many years of fishing on this ‘quiet lake‘; panfishing has been their thing, but this lake also boasts a nice walleye and muskie population. 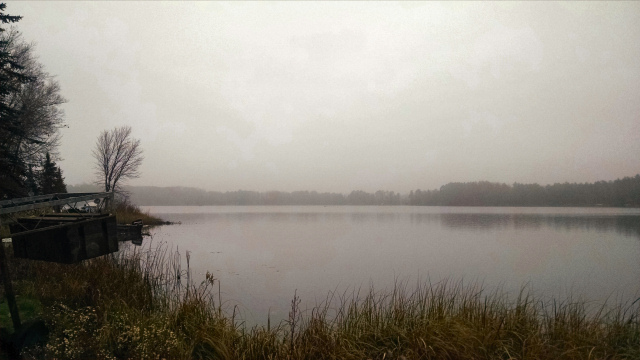 More fishing and scenic boating opportunities can be had by traveling down the channel from the southeast corner of Lost Land Lake, into Teal Lake, and then even further through to the Teal River Flowage area! 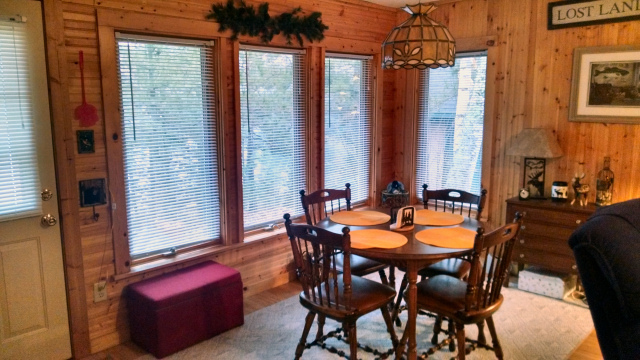 Going back to the cabin – you will love how it was remodeled in knotty pine! The vaulted ceiling gives a feeling of spaciousness in this 600 sq ft cottage, and you will like to open flow from the main room, to the open kitchen, and back to the bedrooms. Well-maintained with a recently-new roof, water heater and appliances. All furnishings are included – just move in and enjoy right away. Your roll-in boat dock has new boards and extra storage is provided in a common-area garage too. The lakeshore for the cabins is enjoyably level, and includes a large firepit, fishcleaning house and private dock areas for each unit. Condo fees are $500 per year and include most of the exterior maintenance costs for the property – you just show up and enjoy your time up north without having to take care of lawn work or snow removal. The cabin can be used as a 4-season, and has an LP non-vented gas stove to warm the cabin, a septic holding tank and shared well. 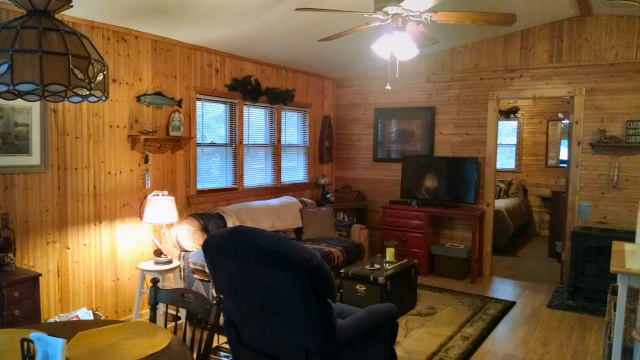 This is a fantastic cabin for you to enjoy this beautiful wilderness lake and the northwoods of Wisconsin – come take a look today. This entry was posted in Area Lakes, Cabins For Sale Hayward, Condos For Sale Hayward, waterfront cabins, waterfront condos and tagged 12444N Morgan Rd for sale, 4-season cabin for sale hayward, area north realty, cabin for sale hayward, cabin for sale wi, cabins for sale in hayward, cathy lareau, cathy lareau realtor, chequamegon national forest, Condominium, cottage for sale hayward, lost land lake cabin for sale, lost land lake condo for sale, lost land lake hayward wi, muskie fishing lake cabin for sale, quiet lakes in hayward wi, quiet lakes in wi. Bookmark the permalink.